It's been hot, we've been staying inside a lot. But we've managed, in the past week, a beach day, a movie indoors with friends, two trips to the market, three swims in our wonderful neighbours' pool, a fantastic visit with our dear aunt, and even to move both kids into one room (for no other reason except that they wanted to be together, if only just for the summer). So it has been hot, but it's been good! 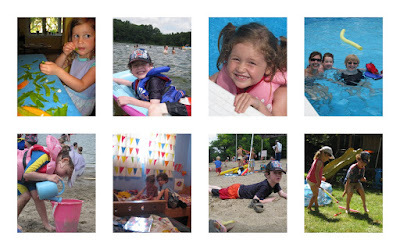 In the past days - daze - of summer, we've celebrated a year or two, or ten! Had a few nights to ourselves, thanks to grandparents who gave our kiddos a few amazing days after which they came to retrieve us from our celebratory bliss in Stratford. We've contemplated whether or not to domestic the cute little buggers who've been living inside of our vegetable garden. But decided not to since we do live on MacGregor Cres and need to uphold a certain lack of tolerance for lettuce munching bunnies. Rosie's made some tea with mint from the garden. Lego, lots of lego. The computer is there with a picture of Optimus Prime for him to duplicate, and he does, and it transforms. And dishes, she loves doing the dishes. Topping it all off with fun at the Market today. Good times, loving those summer afternoons. That's how it feels a bit this morning. Kids are both at first day of camp. William's at the ESQ camp for five full days at UW, he was happy to go. Rosie's at a preschool morning program, only five 2-hour sessions, I think she was crying when I left. I've got an hour now to work on a new story, just starting. We'll see how that goes, tomorrow will probably be easier.